A month or two ago a knitting friend sent an email, wondering if a couple of us wanted to sign up for Tour de Sock. I checked it out – six waves, knitting socks, potentially challenging patterns – and said sure, let’s do this. So we signed up and cobbled together enough to make a team, and waited eagerly for the first pattern to be released. 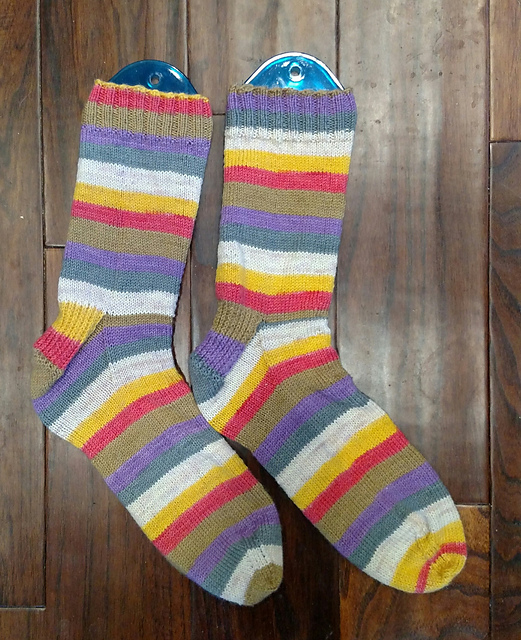 I’m two patterns down now, and have already made a couple other pairs on the side, so I’ve decided that during this challenge, I’m going to try to do as many socks as I can (not just the required six), and turn this into a Summer of Socks. The others don’t count to the race; this is primarily to try to clear out some of the sock yarn stash (which is a good thing since I might possibly have succumbed to the siren song of a really great sale recently and have a bunch more lovely sock yarn winging its way to me even as I type this, so it’d be nice if there was room for it). I’m counting any pair of socks *completed* as part of this personal challenge since, despite my years-ago vow to only ever have one pair of socks on the needles at the time (edited to allow for one pair per needle size, since I use a different size for socks for Richard), I’ve got a couple pairs of socks on holders, stuffed into project bags and waiting to be done. So here’s the first pair to share, which isn’t actually one of the Tour de Sock patterns at all. This is my basic sock formula, made with Knitpicks Felici in Time Traveler. Since we’re both Whovians, and Richard’s favorite doctor is Tom Baker, I knew as soon as I saw this yarn that I had to get it for him. Took me a couple years, but eventually I got around to it. I started these in the airport on the way up to Seattle and finished them two days later, on the train. I can get *so* much knitting done when I’m traveling!